Each robot needs to be charged for at least 3 hours to work for a day. Four robots are deployed currently at the restaurant. Hyderabad: In a first of its kind initiative, a restaurant named ‘Robo Kitchen’ has come up in Hyderabad. The speciality of this place is the ‘Beauty Serving Robot’ which are always on duty to serve the customers. The restaurant has four robots that are to be charged for at least 3 hours to work for a day. At this robot-themed restaurant, customers can order food of their choice such as Chinese or Thai dishes without interacting with a waiter. Every table at the restaurant has an iPad through which orders can be placed directly. Once the order is made, the robot picks up the food from the chef and delivers the same to the right customer. The trend of robot restaurants is usual in places like Japan, China, Bangladesh and other western countries. 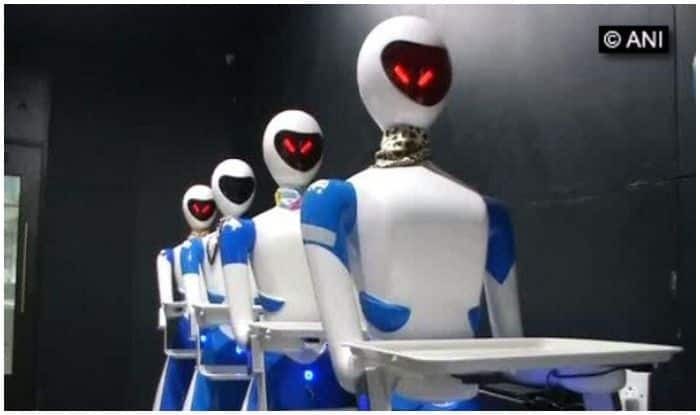 Inspired by the ‘robot theme restaurant’, a group of youngsters in Chennai had earlier decided to start a venture that employs robots to perform manual tasks. The restaurant was set up in Chennai last year. Jagadeesh, a partner of the ‘robot theme restaurant’ said that the robots are imported and come in different colours. Moreover, the restaurant has some manpower to programme the machines, he said. “Each table has a tablet and the customer just have to enter the dishes they need on it and press send and the order will reach the cooks and once it’s done, the cooks will send out the robots to serve to the respective tables,” added Jagadeesh. These robots are capable of understanding two languages namely English and Tamil, said the restaurant partner.